Average Height	: 8" - 12"
Average Weight	: 8 - 13 lbs. 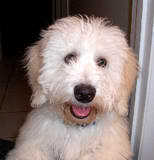 The Coton is a Bichon-type related to the French Bichons and the Italian Bolognese. It is even possible in some cases that native dogs of other types were crossbred. It most likely arrived in Madagascar with French troops, or with the administrators who followed. The breed was virtually unknown until it was reintroduced to Europe and America in the last 20 years. For centuries, the Coton was a favored companion of the wealthy residents of Tulear, in southern Madagascar, where it continued to breed to type. A dog with similar origins was popular on the French island of Reunion, off the east coast of Madagascar, but became extinct. The original Bichon-type extended back possibly one thousand years ago or more. Although still rare, it has enjoyed considerable popularity with the Madagascar upper-class for some years and is becoming increasingly popular in the United States. The breed was recognized by the FCI in 1970. The Coton is the "Official Dog of Madagascar," and a tricolor Coton was honored on a postage stamp in 1974. The Coton de Tulear is a very happy breed. They seem to constantly be smiling, wagging their tails and wanting to be around the family. They do best when they are left alone only for brief periods of time. The Coton de Tulear is not a good breed for a family that will be gone more than they are home or that don't have time to spend with their pet on a regular, daily basis. The Coton De Tulear is one of the healthiest breeds of dogs with very few health problems..
Daily grooming is key to keeping the coat of the Coton de Tulear looking its best and free from mats and knots. While they are not a shedding breed the longer, dead hairs if not removed from the coat will cause skin irritations as well as mats and tangles in the coat that can become very significant in a short period of time. Daily grooming either by brush or comb will keep the coat looking soft and tangle free with just a simple routine that shouldn't take more than five minutes. The Coton de Tulear usually only sheds hair when been groomed, much like a human loses hair when they brush. Since the hair is so dry to the touch and silky, it is typically easy to groom using a wide toothed grooming comb or a pin brush. Start at the neck and groom down and back, following the direction of hair growth. The Coton de Tulear will never have a sleek, lie down on the skin type of coat so it is not essential to worry about exactly how the hair appears on the body, a windblown look is considered the best for the breed. The coat of the Coton de Tulear is naturally very clean and should only be bathed once or twice a year, never more frequently. It is important to trim the hair on the feet to prevent it from matting between the pads and becoming uncomfortable or absolutely painful for the dog. This can be done with blunt ended grooming scissors that prevent any possibility of nicking the skin. The ears should also be carefully checked and cleaned with each grooming and any long hairs in the outer ear area should be plucked to avoid irritation for the dog. Show Coton de Tulears may not be trimmed or clipped, although many pet owners choose to clip the hair over the eyes as well as clip or trim the hair on the body. When clipping or trimming the Coton de Tulear it is possible to do it yourself or simply take the dog to the groomer. If you are using a professional groomer clearly explain the type of cut you want and even ask to see pictures of what the clip or style will look like on your dog to prevent any surprises. Most groomers will allow the owners to stay with the dog, at least for the first session, to ensure that the clip is just what the owner is expecting. The Coton de Tulear is a great indoor dog in that he or she will keep active in the house and does not need to be regularly outside in the yard. As with all types of dogs the Coton de Tulear does need regular exercise to stay fit and healthy, but this can be complete through inside activities such as fetch as well as going for regular, shorter walks. The Coton de Tulear will also adjust to long, lengthy walks or romps outside in the yard with the family. Due to its soft and cotton appearance many people mistakenly assume that the Coton de Tulear is a very delicate or fragile dog, which really isn't the case at all. These dogs love to run and play, especially with other dogs and pets. One of the best forms of exercise for the breed is a companion dog that will keep them active either in or outside of the house. The Coton de Tulear is naturally very playful and is a wonderful natural retriever, enjoying a game of fetch for as long as the owner is willing to throw the ball or toy. The Coton de Tulear is also an avid swimmer and loves to get into the water. With their cottony white coats this can often be a bit of a concern, but they are a water loving dog and will take every opportunity they can find to go in for a swim. They love long walks and hikes and are even a great jogging companion for an active family or individual. Traditionally the Coton de Tulear used to run alongside the owner's horse, able to go for miles at a brisk jog or light running pace. Training the Coton de Tulear is a very pleasant experience although they are occasionally a bit headstrong and stubborn. The breed is very lovable and wants to please the owner, making them very responsive to positive training methods that use praise and small rewards. They are quick to learn both good and bad habits and will find many endearing little things to do when they think they may be in trouble. Many Coton de Tulear are naturally adept at learning tricks like walking on their hind legs and sitting up to beg. The Coton de Tulear, bred as a companion dog for so long, seems to have the ability to understand what the owners is wanting before the command needs to be given. They are ideal obedience and agility dogs and seem to love competition and being in the spotlight. As with all breeds they do need consistent training and a puppy obedience class is highly recommended to provide both socialization as well as a good understanding of the basic commands. Most Coton de Tulear are very clean dogs and puppies and will almost housetrain themselves given the opportunity to get outside when needed. They are also excellent dogs to crate train although the owners must be committed to following the routine and ensuring that the puppy gets outdoors or to the designated areas when in the crate.